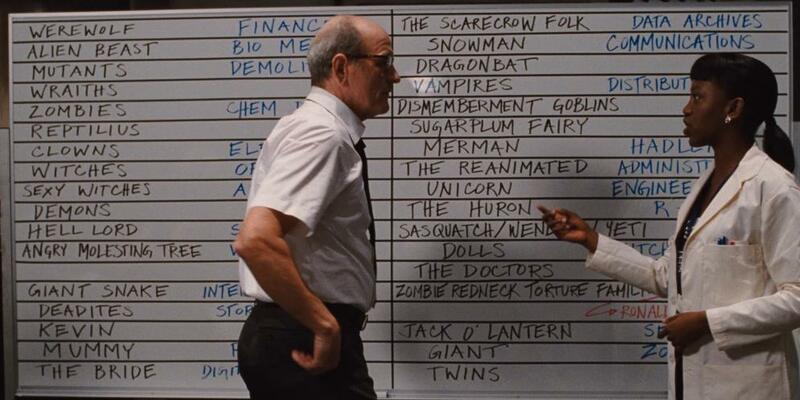 Brian Terrill's 100 Film Favorites - #74: "The Cabin in the Woods"
Warning: It is virtually impossible to write anything about this film without giving spoilers. If you haven’t seen it, just know it is a hilarious, creative horror/comedy which pokes fun at the conventions of the slasher genre, and horror films more broadly. Also Joss Whedon made it, and, as the whole internet will tell you, Joss Whedon is pretty great. Now go watch it before you proceed reading. I’ll wait. OK then. The Cabin in the Woods begins with the tried and true slasher set-up: A group of teenagers go on a vacation into the mountains, to camp at a desolate cabin…in the woods! But, as the viewer quickly learns, the entire cabin and the surrounding forest are in fact a highly-advanced soundstage for the production of a horror movie. Horror movies, it’s revealed, are produced by shadowy government organizations. These “productions” are actually rituals carried out to appease a group of Lovecraftian demons poised to destroy the world if the proper steps are not followed precisely. This, you see, is why horror films (and specifically slasher films) are so formulaic…the “Old Ones” decree that young people fitting each of a number of stereotypes (“the whore,” “the athlete,” “the scholar”) must be sacrificed in a certain order, leaving a virginal “final girl” alive to the end to decide her own fate. To keep the primordial god-monsters happy, all the world’s governments have similar agencies dedicated to the performance of “The Ritual,” pumping out cookie-cutter horror movies year after year. The two most successful and prolific agencies are our own American department and the Japanese one (a nod to the success of “J-horror” films like The Ring and The Grudge). Throughout the story, the film intercuts between scenes of the teenagers’ predicament inside the cabin, and the operations at the agency nerve center, where various technicians act as “puppetmasters,” manipulating every detail of the cabin set so the Ritual will go as planned. Take a close look at the board. Most of the creatures listed eventually turn up on-screen. The zombie family begin hacking apart members of the group, but not before “the fool,” a stoner who bears more than a passing resemblance to Shaggy from “Scooby-Doo” begins to find evidence of the organization “pulling the strings.” Eventually, he and the final girl make their way to the tunnel through which the Buckners emerged, and find an elevator system which they ride back into the heart of the agency, past dozens of cages containing other monstrous possibilities they might have unleashed. Upon being discovered, the government agents reveal their ruse, but insist that the teens must die if the world is to stay safe from the wrath of the Old Ones. Not willing to give up without a fight, the two surviving teens press a button which opens all the cages in the elevator network, releasing a menagerie of horror. A colossal monster mash for the ages ensues, and nearly all of the agents are killed. Then, the survivors are confronted by “The Director” (played by Sigourney Weaver), who again implores them to sacrifice themselves for the sake of the world. Instead, the teens decide that, if this kind of ritual is what’s required to keep humanity alive, maybe humanity isn’t worth it. They opt not to kill one another, and the film ends with a colossal demon hand exploding out of the Earth. 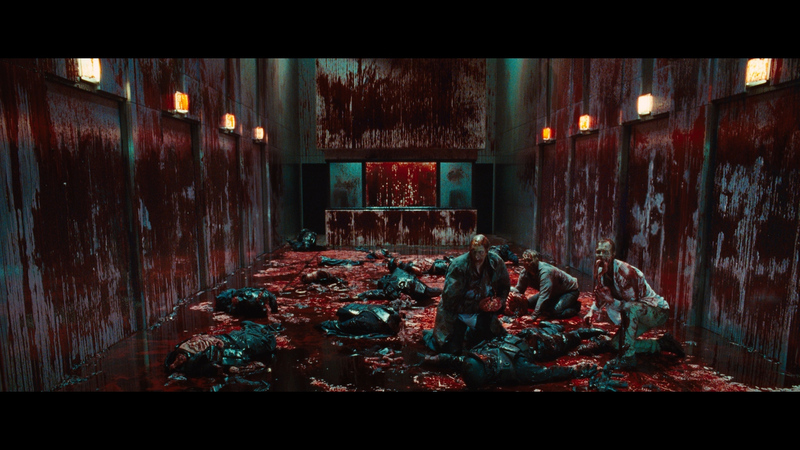 The Cabin in the Woods is simultaneously a love letter to and a scathing condemnation of horror fans. It features copious references to famous horror films (most explicitly the Evil Dead and Hellraiser franchises) and the tropes of the genre. The allusions to the successful Japanese horror film industry, and a passing reference to Spain (home of the [REC] series) as an emerging market were a clever touch as well. The government agents, so well-versed in horror movie cliches that the butchering of teenagers has become standard nine-to-five grunt work, are a source of much of the film’s humor…as well as its social critique (when one of the agents admits that he’s “really starting to root for” the final girl, who’s suffering a brutal beating on one of their monitors, his focus abruptly shifts when a technician brings in celebratory tequila). It’s so nice when you can find joy in your work. Some people have criticized the ending of Cabin in the Woods as not fitting with the rest of the film. To have the two surviving teenagers fight so hard to make it to the end, only to abruptly opt to die, and sacrifice the entire world in the process, doesn’t seem to mesh with their characters. However, after a couple repeat viewings, I believe the ending is meant as a message from Whedon himself, a rebuke of sorts to the audience. This is easiest to see if we think of “the Old Ones” as a metaphor for the film’s audience. When she appears, “The Director” warns that “in 8 minutes, the Old Ones will rise, and the world will end.” This line is spoken exactly 8 minutes from the end of the film. After that, as with all films, the audience “rises” from their seats, and the world of the film ceases to exist. When I first considered this, it was pretty mind-blowing. But the metaphor holds up – Whedon seems to suggest that the reason the film industry keeps churning out identical horror films is because it continues to satisfy us, the audience of “Old Ones.” And if the carrying out of this same rote “ritual” is what film-goers demand…then screw us. If humanity doesn’t go for some cinematic innovation now and again, maybe humanity isn’t worth it. It’s a pretty bleak message, but one worth heeding. If we don’t want to see the same thing over and over again at the cinema, maybe we should stop paying to see it. And if we DO want to see the same thing over and over again, maybe we should think critically about why that is. We’ve been giant monster hands all along! 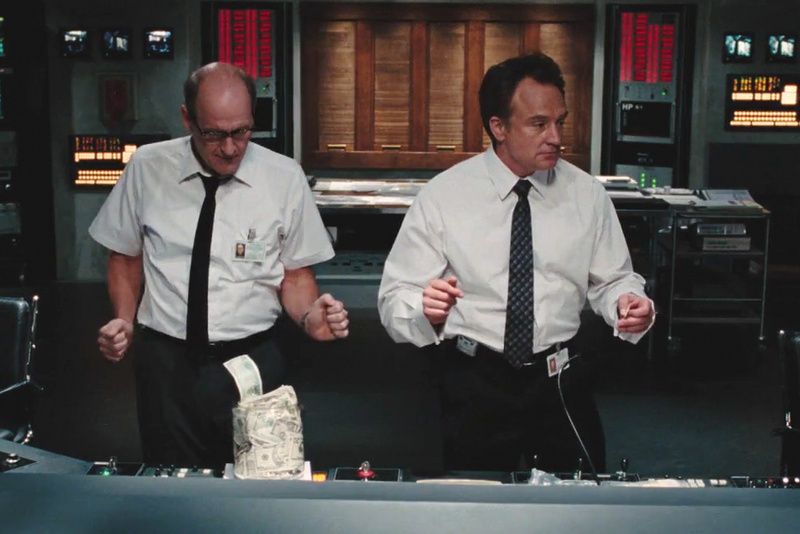 The Cabin in the Woods is a thoughtful, funny film which strays from the “Ha ha I made a reference” school of horror/comedy practiced in the Scary Movie series and its ilk. It’ll make you think more about your film-going practices than probably any other film on this list.